Everyone knows that Asheville is the place to come if you want to spend big money to get married in a shabby chic barn, sitting at large picnic tables with mason jar centerpieces. 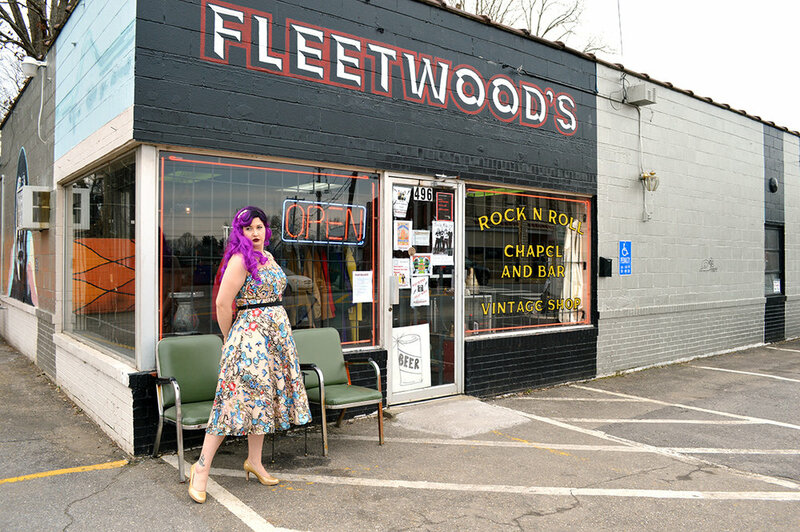 But for those of you who prefer the kitschy feel of a vegas style elopement, Fleetwood’s is here for you. In 2017 Fleetwood’s opened on Haywood Road in the building where Daggitt’s Pawn Shop once occupied. 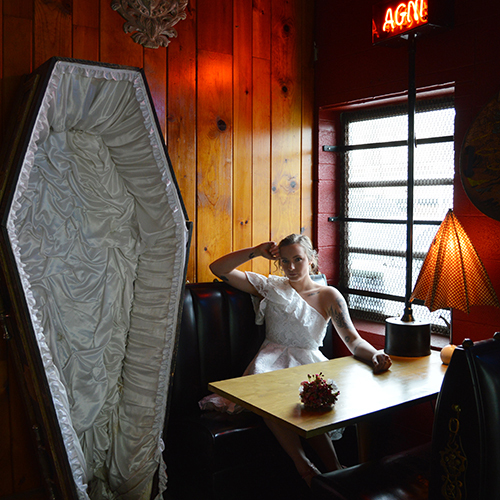 It’s not just a bar, or music venue, or thrift shop, or a place to take Instagram worthy photos… it’s also a rock n roll wedding chapel. The typical wedding in Asheville costs just over $20,000 (2017 statistics from The Wedding Report). However, there are still a lot of budget conscious couples who are looking to spend less, a lot less. Fleetwood’s stepped up to offer basic weddings from $99, and $399 weddings that cover almost everything except catering. 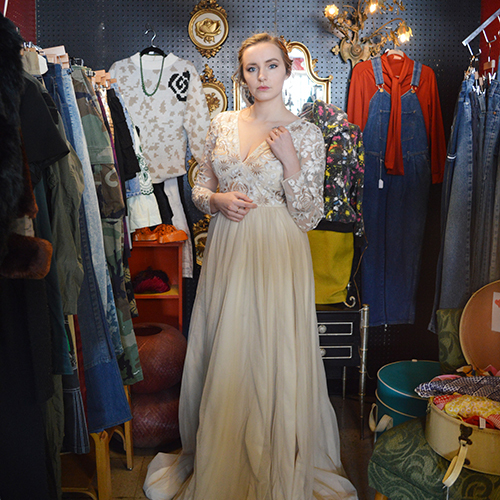 The love for all things vintage is apparent when you walk in the door. 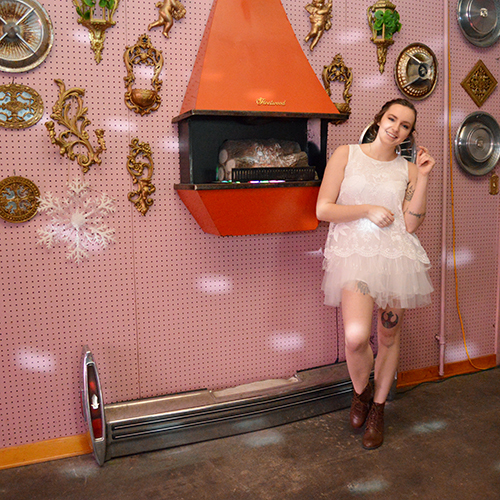 Clothes, accessories, records, and even some truly unique pieces of furniture are there thanks to owners Christi and Simon, who are also the minds behind Asheville Flea for Y’all. With their other partner, Mary, the owners of this establishment not only make Asheville a better, cooler place for the people that live here, but hope to drive wedding tourism for people who want an alternative to flying to Vegas. Four nights a week, Fleetwood’s features events like music, karaoke, movie nights, comedy and more. Unlike a lot of other clubs in the area, Melissa, the friendly booker and barkeep pays special attention to book acts that are women, minorities, and LGBTQ. On February 14 they have an extra special annual event, a Valentine's Day Mass Wedding. At this fake wedding, officiated by local comedian Blaine Perry, you can marry yourself, someone else, or anything you love. Like, seriously… anything: pets, comic books, your job, or a concept, WHATEVER! They will supply the ring and a Fleetwood’s fake marriage certificate to commemorate the event. A fun-filled reception will follow with a champagne toast, cake, and a DJ dance party for participants and guests alike. Learn more about Fleetwood’s by visiting their website or showing some love on Facebook & Instagram.